Laboratory: Corrosion Control Consultants and Labs, Inc.
content of the paint on the bridge was 36% (360,000 PPM). a. The paint was removed with a needle gun from two areas, one that was treated with 40 mils (wet) of PreTox 2000 and one which had no treatment whatsover.The waste generated from the PreTox 2000 treated areas leached (TCLP Method 1311) lead at 0.75 PPM, while the untreated area leached lead at 35PPM. b. Paint was also removed using abrasive blasting techniques. Paint was removed using typical production equipment and pressures. The abrasive was garnet, used at 4 pounds per square foot. The paint was blasted from two areas, one with no treatment and one which had been coated with 40 mils (wet) of PreTox 2000. The waste generated from the PreTox treated areas leached (TCLP Method 1311) lead at 0.2 PPM (BDL), while the untreated area leached lead at 40 PPM. The waste generated from each area was analyzed using the Multiple Extraction Procedure (MEP). 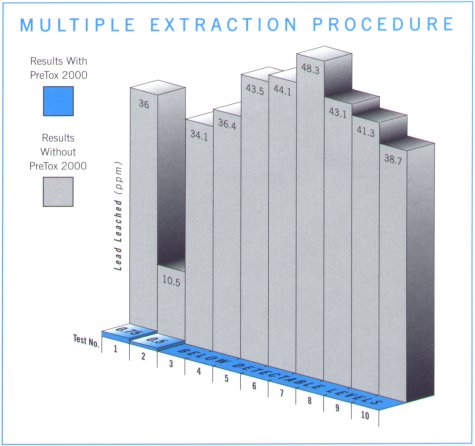 The MEP protocol consists of one TCLP followed by nine leaching cycles using a mild acid solution. The results on the two wastes are as charted. New customers convert to PreTox weekly. Please call us at 800-338-8296 for a current list of references.